Formations are far more important – and intricate – than ever before in real football. It’s the same deal for PES 2019, as the way your team is set up, and the multitude of options at your disposal, can often mean the difference between glory and a bitter loss. Here at GamesRadar+, we don’t want you to taste defeat. That’s why we’ve put together the best PES 2019 formations to help you get the upper hand on your opponents. Why should I use this formation? 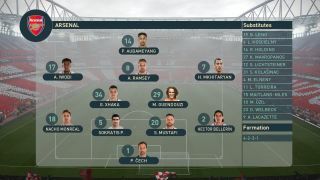 While PES 2019, strangely, doesn’t have a wingback formation, you can still utilise the formation that’s taken the Premier League by storm in recent years – with a slight twist. A 5-2-3 gives you a defensive safety net while also providing lightning-quick counter attacks with the two wingers supporting a lone striker. It’s perfect for those looking to overload the wingers and bombard the opposition area with crosses. Avoid: To really thrive with this formation, you must ensure you A) have two central midfielders who have both pace and power – otherwise you’ll leave a gaping hole in the middle of the park – and B) a physical presence up front, lest you want your striker to be shut down by opposing defenders. Advanced Instructions: For this formation’s attacking style, be sure to set the attacking style to ‘Counter Attack’ with an emphasis on a ‘Wide’ attacking area. The support range dial, too, can be moved up a notch to seven or eight to give you far more scope for a brutally swift counter attack. Additionally, you must have attacking full backs on under advanced instructions, otherwise the full backs will have a tendency to sit a little too deep, rendering the extra wide players – your ace in the hole – effectively redundant for much of the game. There’s nothing wrong with going a little old-school now and again, is there? For more, ahem, limited teams, the 4-4-2 can prove to be a formation that’s at once tough to break down and also able to catch teams out who overcommit. It’s not necessarily a defensive formation, but can be used to startling effect when you know you’re coming up against a player (or AI) who’s likely to dominate proceedings with a possession style of play. Avoid: In fairness, a 4-4-2 manages to mask many weaknesses in your squad, which is why it’s so useful, but there are a couple of things to steer well clear of to make sure you’re getting the most out of your formation. Slow, ponderous wide players are one of them. Wingers are key to the success of the 4-4-2 and, without them, you’re in serious danger of being pushed back. Also, while any of striker can pay dividends here, it’s crucial that in the centre of the park you have one play willing to bomb forward and join the attack while one more defensive-minded player holds a little deeper, otherwise the front pair can become isolated. Advanced Instructions: If you’re feeling particularly confident in the defensive capabilities of the 4-4-2, be sure to set Fluid Formation to ‘On’ and only use the 4-4-2 to be used when out of possession. It’s a defensively sound shape and you can then quickly switch to one of the most attack-heavy formations on this list to move in for the kill in the final third. As for actual advanced instructions, I’ve found that putting Counter Target on as part of the defensive instructions means that, particularly if you have a quick player or two, you can have them stay on the shoulder of the last man while everyone else is defending. A quick hoof up to them ensures that you always have a chance of catching teams who overcommit unawares. At first glance, this formation may be a little too gung-ho for all but the most foolhardy of tacticians. Persist with it, though, and you’ve got yourselves a supremely offensive formation that makes sure that you’re controlling the ball at all times, with the right instructions. rampant in free space when not on the ball. You could ignore that and play it safe – or you could cheese the hell out of the game and use it to your advantage. Guess which one we’re going for? Avoid: Don’t use this unless you have several players capable of dribbling at speed. Any players who see their first (and second, third, and fourth touches) head into another postcode shouldn’t see any playing team under this formation. Make sure your DMF is at an elite-level, too, otherwise he’ll be overrun from first whistle to the last. Advanced Instructions: Don’t be fooled by the starting positions of your players in this formation. Keep things simple with Possession Game enabled under Attacking Instructions. This allows you to have a free man in front of you at all times. Elsewhere, a false 9 being set up under Advanced Instructions, as well as Gegenpress coupled with Frontline Pressure, aggressive pressuring, and a fairly high defensive line should mean the opposition won’t get a minute’s rest. Arguably the strongest all-round formation in the game, this 4-5-1 variant keeps things tight in the centre of the park but also gives you enough freedom to play how you want to play. Want to utilise a Kevin de Bruyne-esque figure in attacking midfield but want to flip to a wing-based attack whenever you feel like it? It’s all possible here. Avoid: There isn’t really much that you should outright avoid here. Your striker should be capable of hitting first time shots fairly well as there may be moments in the match where he’s starved of both support and space. That aside, your two DMF pivot must have at least one midfielder able to, y’know, defend. I’m looking at you, Arsenal. As already mentioned, you can do pretty much whatever you please here, depending on how you want to play. Applying Centring Targets does work exceptionally well, however, for strikers that have good-to-great reaction times. That aside, it might actually be wise to turn off all defensive Advanced Instructions. Simplicity is key on that side of the field with this formation. Let the defenders defend and attackers do what they do best. It’s a setup that no one in their right mind would use in real life – but that hardly means it won’t work in PES 2019. The 3-2-4-1 (essentially a 3-4-2-1, despite Konami’s weird numbering) gives you the best of both worlds: a solid, rigid defence, plus the possibility of having five players attacking at all times, should you make good use of the wide midfielders. Avoid: Slow midfielders, again, really aren’t going to be of much use here. The entire formation is predicated on the wide players changing the game, so they’re going to need to be bombing up and down the wing at great speeds to help stretch the opposition. Aside from that, one of the two AMF players needs to be able to pass the ball well, otherwise things can break down pretty easily. Wing Rotation feels like an absolute must here. Often during games, I’ve used it to have two of the AMFs darting into space left after one of the wide midfielders has dragged an opposition wingback towards him. In fact, it might be a little too good. Expect that to be patched at some point but, for now, use that and the Attacking Full Backs instructions to good effect. If you want even more hidden tricks, check out our PES 2019 tips. PES 2019 is out now on Xbox One, PS4, and PC.